The problem with apple trees, as you may already know, is that they produce apples whether we want them to or not. And then, starting toward the latter part of August, they drop fruit all over the place. Conscientious householders would now what to do about this. They would go online and find helpful answers, on Mother Earth News and elsewhere, to the question: What to do with windfall apples? Or if they’ve waited too long, what to do with rotten apples? Apparently there are several things you can do, all of them sensible and frugal, with various nutritional benefits. They all take work, though, starting with cutting out the bruised sections on the outside and the wormy parts in the middle of each one. 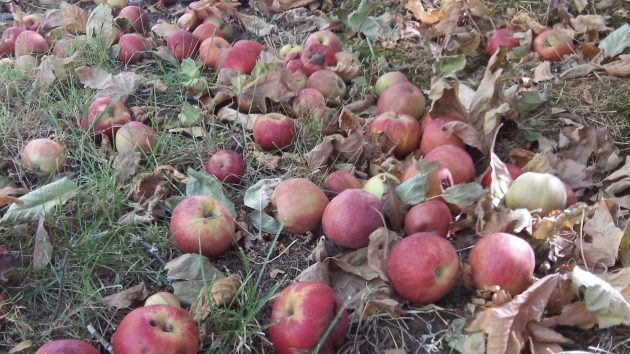 And in case most of the apples on the ground are already too far gone, about the only beneficial alternative is to add them to the compost heap. Or you can gather them up by hand, one by one, and toss them in with the yard debris. And there, the benefit is about an hour of vigorous daily exercise — or more, depending on the size of the tree — a form of exercise whose only upside is that it is free because it requires no machines or mechanical device. Some time ago on Oak Creek Drive (Corvallis) I saw horses straining their necks to get apples on a tree almost out of reach. Sometimes we’ll toss overly ripe apples to hungry and grateful deer that meander our North Albany neighborhood. We used to have a pear tree but got rid of it because somewhere along the line, I didn’t acquire the preserve-your-harvest-by-canning gene as my predecessors so faithfully did. Our rural deer love our wild apples. Surprised yours don’t. And we have spent hours with an old dehydrator preserving pear pieces.. after cutting out all you mentioned above and adding those parts to compost. It seems like gleaners or other groups might be interested in all the free fruit literally falling into the street right now. It seems like a waste of potentially good food. Growing up on a Linn Co. farm, gleaners were always appreciative of the opportunity. If you have a compost pile, why would you bother with the yard waste cart? So you can buy back your own apples in the form of finished compost? For the last 20-25 years it has been considered risky to eat windfalls uncooked. I am still a little skeptical about it, but there is some evidence of pathogenic e. coli in Oregon deer. We do see deer in the orchard. I’m happy if they trim the trees and leave our roses alone. If I use windfalls, they become applesauce. It’s also safe to make hard cider. Our plan is to eventually get chickens to help with the apples. They could not eat all we have, but they’ll eat the bad larvae and tromp the rest into the soil. But then I’d have chickens to manage. Here’s a radical idea — harvest them before they become “windfalls”. Over the years, we’ve canned, frozen, dried, and made fruit leather. Suddenly a song about Johnny Appleseed is playing………..
Let the sweet sounds of song play! !